MACON, Ill. – As Macon Speedway rips deeper into September, the racing season stays hot even if the weather starts to cool off. So let’s update you on what we’ve got planned for the final weeks of the racing season. Heinkel’s Three Dog Night features food, fun and giveaways from Heinkel’s, the Decatur tradition since 1912. The meatpacking plant specializing in wieners, sausages and smoked meats. It’s also Bud Light Ladies Night Championship race presented by Y103. Gals from Woody’s (Laurel Phipps and Brianna Livingston), Rocco’s (Jenny Cramer and Dana Damery), Starship Billiards (Dawn Reynolds and Holly Vinson) and Pop’s Place (Christine Vogel and Michelle Perry) compete for prizes and a trophy for the bar she represents. Pro Late Models will also run for $500 to win plus a two-night point fund combined with the action from Lincoln (Ill.) Speedway on Friday, Sept. 12. The overall winner gets another $400 with second place taking $200 with money for third ($150), fourth ($100), fifth ($75) and sixth ($75). Also running are Billingsley Towing Modifieds, Street Stocks, Sportsman, Outlaw Hornets, Stock Hornets, Beach House Mini-Sprints and Illinois Lightning Sprint Series. MOWA Sprints presented by DynaGraphics and ILMO brings the winged sprint cars for their only appearance at Macon Speedway this season. Look for giveaways from DynaGraphics and ILMPO. The Hornet World Championship pays $300 to win in the Outlaw Hornet division plus the state championship trophy, and the Stock Hornets will also race for the championship trophy. It’s also Scout Night with scouts participating in the flag ceremony and pictures with a real race car. 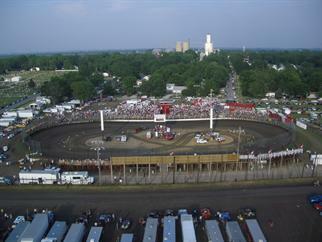 Also racing that night are Billingsley Towing Modifieds, Street Stocks, Illinois Lightning Sprint Series and B-Mods. Macon Speedway concludes its 69th season of racing with racing in six divisions. Billingsley Towing Modifieds, Street Stocks, Sportsman, Outlaw Hornet, Stock Hornets and Illinois Lightning Sprint Series all compete on the legendary track.